The New Mexico Military Institute Board of Regents is composed of five members appointed by the Governor of New Mexico for terms of six years. The Board is responsible for the governance of the New Mexico Military Institute as the Institute executes its statutory responsibility to provide education and training for the youth of this country that is of as high a standard as like institutions in other states and territories. This responsibility is exercised by the Board only as a unit. The Board’s power to govern New Mexico Military Institute includes fiduciary responsibility for the assets and programs of the School, establishment of policies to guide the Institute, and oversight of the functioning of the School. The Board vests responsibility for the management and operations of the Institute in the President/Superintendent. Bradford Christmas graduated from NMMI’s high school division in 1970 and attended one semester of Junior College before transferring to Oklahoma State University. Mr. Christmas is a current and past member of New Mexico Military Institute Board of Trustees, also serves on the board of directors for New Mexico Cattle Growers Association, Vice President of the Board of Directors Parker Center for Family Business, a division of Anderson School of Management at UNM, and also the member of many organizations to include New Mexico Farm and Livestock Bureau, and American Quarter Horse Association. Currently Mr. Christmas is the President of Christmas Ranches, Inc. in NE New Mexico, President of Christmas Enterprises, Inc. a licensed general contracting company and marketing of heavy equipment and appraisal services, and the manager of family royalty interests in the oil and gas industry. Mr. Christmas entered active duty in December 1971 and commissioned 2Lt in August 1973. He returned to NM Army National Guard and served as Platoon Leader Clovis, NM, Platoon Leader and Executive Officer Raton, NM, and Company Commander Clayton, NM with Honorable Discharge. Mr. Christmas lives in Wagon Mound, NM with his wife of 42 year, Becky and they have three children. Timothy Paul graduated from NMMI’s High School division in 1982 and Junior College in 1984, which included a commission as a Second Lieutenant. He completed his undergraduate studies at the University of New Mexico. He holds a MS from Embry-Riddle University and MA from the US Army War College. He served in the US Army for 30 years, retiring as a Colonel. COL Paul served in a variety of command positions, from platoon to brigade, he went on to serve in strategic leadership and staff positions world wide. He is a Master Army Aviator, having flown a variety of Army fixed and rotary wing aircraft, his awards include the Legion of Merit, a Bronze Star and several other Army, multi and joint service awards. Currently Mr. Paul is the Vice President of Operations at CSI Aviation. He is responsible for aviation support and airline operations serving a variety of US Government departments and agencies as well as commercial customers world wide. He enjoys the opportunity to serve and visit customers all over the world. Having learned the value of leadership by example from NMMI, he maintains a current airline transport pilot rating and serves as pilot in command when able. Mr. Paul is married to the former Linda Minoletti, they have four children and live in Albuquerque, NM. Barb Trent graduated in 1979 in the first class of female cadets at New Mexico Military Institute and received her commission as a second lieutenant in the Medical Service Corps. While finishing her bachelor’s degree in Criminal Justice at New Mexico State University she served in New Mexico Army National Guard and is a recipient of the New Mexico Distinguished Service Medal for service at the State Penitentiary riot in 1980. Additionally, she served as a Dona Ana County Deputy Sheriff prior to entering active duty in January 1982 as an Army Military Intelligence Officer. During her 29 years of service, she had several assignments supporting overseas operations including deployments in Iraq and Afghanistan as the Deputy Science Advisor for the U.S. Army’s Intelligence and Security Command (INSCOM) and the Army’s G2 and her final assignment as the Military Deputy to the Director of the National Security Agency’s Science Advisor. She also served an assignment at New Mexico Military Institute as a Professor of Military Science. Barb is now CEO of Cova Strategies, LLC. Cova is a Women-Owned, Veteran-Owned Small Business that provides software development, management and integration services within the Department of Defense, Intelligence Community and Law Enforcement communities. 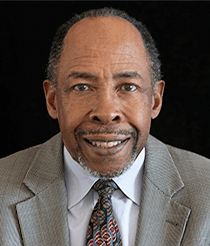 Cedric D. Page received a Bachelor of Arts degree in geography from Syracuse University, and earned a master’s degree (geography) and doctoral degree (geography) from Rutgers University in New Jersey. In June 1995, Dr. Page completed the Management Development Program at Harvard University. Dr. Page held faculty positions at the USAF Academy in Colorado Springs (ROTC Commissioned Officer, USAF), the University of Colorado at Denver, and the University of New Mexico-Los Alamos. He also served as executive director of the Community Technical Skills Center, a nonprofit training organization in Denver, Colorado. Dr. Page held the position of Associate Director for Minority Affairs and Academic Programs at the Washington Higher Education Coordinating Board. He was responsible for developing and coordinating state-level policy initiatives and planning to increase the participation and achievement by people of color and students with disabilities; for monitoring gender equity; and administering the state’s degree authorization, academic program review and the State Approving Agency (veterans’ education programs). As Director of the Center for Social Responsibility and Community at the State University of New York, College at Oneonta, Dr. Page was responsible for administration of grant funds, faculty development of service-learning courses, campus-wide student volunteer and service efforts through the Center, and leading research and community collaboration regarding service. As the Dean of the Faculty at DigiPen Institute of Technology in Redmond, Washington, and Dean of Instruction at UNM-Los Alamos, Dr. Page served as the chief academic officer in all areas related to the faculty, the curriculum, academic programs, and academic support services. As Executive Director of the UNM-Los Alamos campus, Dr. Page served as the chief executive officer for the branch campus. He retired as Professor Emeritus Geography in January 2017 from UNM-Los Alamos and currently teaches online geography courses at UNM-Los Alamos. Dr. Page has consulted with public, private, and nonprofit sector clients on topics that include team building; organizational performance and accountability; accreditation; leadership; institutional diversity (race, class and ethnicity); and teaches courses on urban, human and regional geography. Dr. 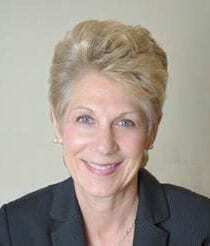 Page has served as a director on the following non-profit boards: Boys & Girls Clubs of Pierce County; Tacoma-Pierce County Math, Engineering & Science Achievement (MESA); the Board of Trustees of the United Way of Northern New Mexico; the Los Alamos Resource Board of Big Brothers/Big Sisters of Northern New Mexico; and the Regional Development Corporation (New Mexico). He served as president of the Santa Fe Branch of the N.A.A.C.P. ; UNM-LA Faculty Senate representative; and as member of the KUNM Radio Advisory Board. Recently, he served on search committees for Big Brothers/Big Sisters-Mountain Region (CEO) and Santa Fe Community College (President). Dr. Page is a public commissioner on the Accrediting Commission of Career Schools and Colleges (ACCSC, Arlington VA), and the Commission on Accreditation in Physical Therapy Education (CAPTE, Alexandria VA). Dr. Page has travelled throughout the U.S. and to Canada, Mexico, Spain, France, Luxembourg, Belgium, Germany, Panama, Jamaica, Eleuthera (Bahamas), and the Dominican Republic. He enjoys golfing, cooking, reading and challenging Scrabble© games with his family and friends. He is married to Doris A. Page, M.D. (retired) and they have two adult daughters and a grandson. 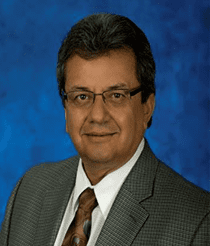 John Garcia is currently the District Director of the United States Small Business Administration’s for the New Mexico District Office located in Albuquerque, New Mexico. He was appointed to this position in October 2016. He is responsible for the statewide delivery of SBA programs and services to support business owners in starting and growing their businesses, create jobs and develop local economies through capital, contracting, exporting and counseling initiatives throughout New Mexico. Garcia first-hand knowledge in business and government, with a strong commitment to our Veterans in our local communities brings a unique asset and advocacy for New Mexico small businesses. Prior to joining the SBA, John Garcia was President and owner of Garcia & Associates, a privately owned consulting company with over 25 years of professional administrative and hands-on experience in the area of inter-governmental relations working closely with the public and private sector at the federal and state level specializing in strategic planning, tactical marketing, and business development with a special emphasis on veteran wellness and stability. John M. Garcia was appointed by the White House as Deputy Assistant Secretary for Intergovernmental Affairs for the United States Department of Veterans Affairs in June 2011. Garcia oversaw VA’s Intergovernmental, Tribal Government, International, and Consumer Affairs Programs. He was responsible for developing, managing and coordinating the department–wide intergovernmental and consumer affairs programs, while providing VA senior leadership with strategic advice, guidance and information by fostering partnerships and acting as a liaison between state, local, tribal and international governments. Prior to joining the VA, he was appointed by Governor Bill Richardson in January of 2003 as the first Cabinet Secretary of the New Mexico Department of Veterans Services. In 1991 Garcia was also appointed to serve as Deputy Chief of Staff for the administration of New Mexico Governor Bruce King and during the King administration was alao appointed as the Cabinet Secretary of the New Mexico Economic Development Department. Among his numerous awards, he has most recently been presented with the Profile of Courage Award by the Vietnam Veterans of New Mexico. He has received the New Mexico Veteran Small Business Advocate of the Year Award by the New Mexico Small Business Administration. He was presented VA’s National Secretary’s Leadership Award and has been honored by the National Association of State Directors of Veterans Affairs for his leadership as President of the organization with the Iron Mike Award. He was recognized with the National Pillar of the Veteran Business Movement Award, and recently was presented with the Veteran Advocate of the Year Award by the Vietnam Veterans of America, New Mexico Chapter. Garcia also is listed among the Who’s Who Among Hispanic Americans. He is a graduate of Leadership Albuquerque and was awarded the New Mexico Business Leadership Award by N.M. De Colores, the National Hispanic Leadership Award by the Mexican American Foundation and the International Leadership Award from The American Center. Garcia has served on numerous boards and commissions and most recently was a member of the National Small Business Administration Veteran Business Advisory Board, the U.S. Association of Veterans in Business, and the White House Task Force on Veteran Business Development. 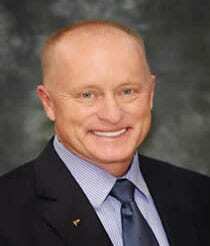 He is also Past President of the National Association of State Directors of Veterans Affairs. In 1969 Garcia was drafted into the United States Army and took his Basic and Advance Infantry Training at Fort Ord., California. He served with the 4th Infantry Division in the Central Highlands of South Vietnam from 1969-1970, and was honorably discharged in 1971. Garcia is a founding member of the Vietnam Veterans of New Mexico and the New Mexico Vietnam Veterans of America. 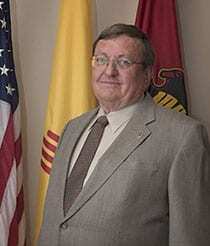 He served 12 years as a Commissioner for the New Mexico Veterans Service Commission. In 1982 he also served in Washington DC as the National Deputy Director of the Vietnam Veterans Leadership Program an initative established by President Ronald Reagan. He was also actively involved with the dedication of the National Vietnam Veterans Memorial in Washington, DC. He is a member of the Veterans of Foreign Wars, the American Legion, the Disabled American Veterans and a life member of the Vietnam Veterans of America. Mr. Garcia attended the University of Albuquerque, Chamber of Commerce Institute at Stanford University and the Kenan-Flagler Business School at University of North Carolina.